Here. Here. Here. Here. Here. And Here. What’s going on here? Why can’t the uber-search engine make something as mundane as text messaging work properly? The first thing to clear up is this – Google Voice is NOT a phone company. In fact, they’re not even close. They buy and sell minutes and phone numbers which are actually provided by companies like bandwidth.com (some Google Voice numbers will be listed as owned by Level3, since bandwidth.com also buys from Level3.) **Fun tip: see www.numberguru.com to find out who owns your number. In order to achieve this integration, Google Voice has likely worked with bandwidth.com to create software that keeps track of who owns what numbers and when. 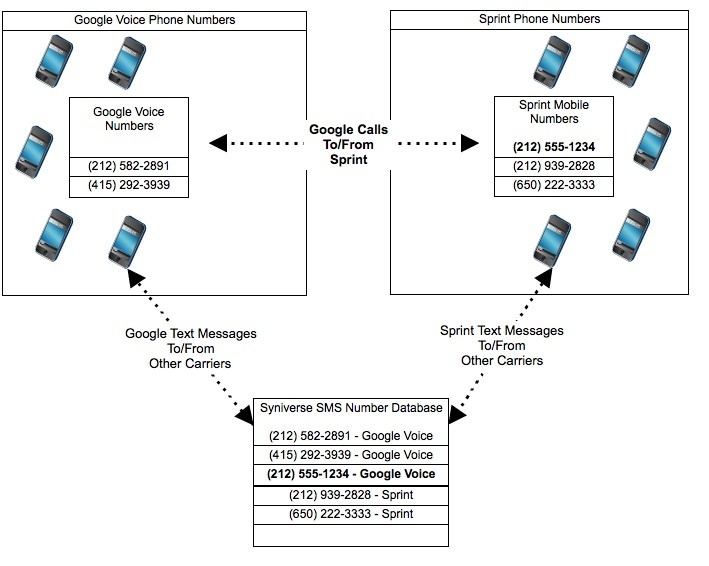 Likely the same integration now exists with Sprint, since you can use your Sprint number and integrate it with Google Voice. How does this all really work? Say hello to the number inventory system. 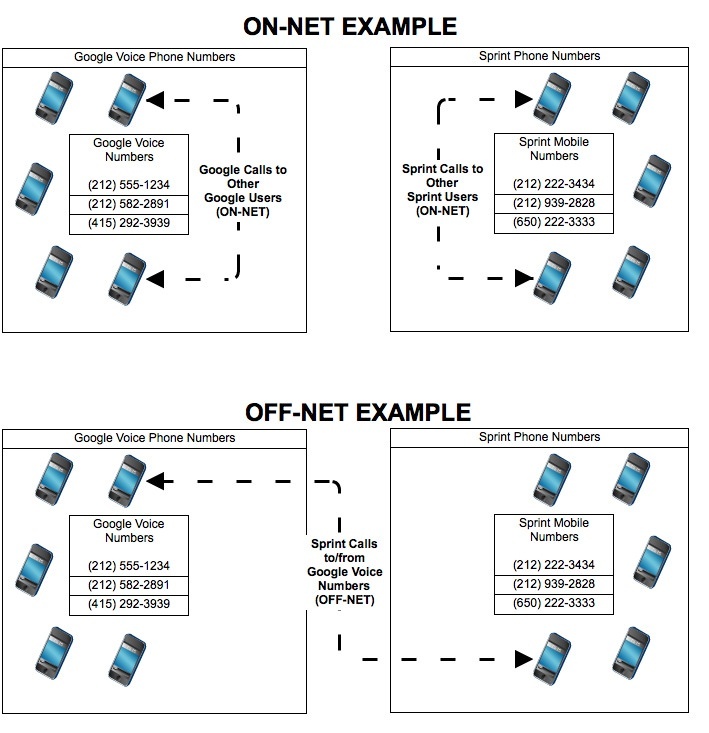 Number inventory systems keep track of what numbers are owned by whom for the purpose of routing calls “on-net” or “off-net.” An on-net call means you’re calling someone within the same service provider – for example, a Google Voice subscriber calling another Google Voice subscriber. An off-net call means you are calling someone at a different company – for example, a Google Voice subscriber calling to Sprint. Since we are visual beings - here are some images to illustrate what this looks like. If a caller calls or texts another number within the same network, the call is designed to stay within that particular network to save money. So if one Google Voice user calls another Google Voice user, the call most likely won’t leave the Google network at all. But if you call a non-Google Voice number, that call hits bandwidth.com, who checks if they own the number. If they don’t, bandwidth.com passes the call onto Sprint or Verizon or AT&T or whoever does. This would all work just fine if number ownership remained permanent. But number ownership is NOT permanent, and that’s where the problems ensue. In 1997 the FCC passed the Local Number Portability (LNP) act, requiring phone companies to allow you to move, or “port”, your number from one phone company to another. The idea was simple — let people keep their phone number and move it to another carrier who is offering better service or better deals, at any time. So what really happens when you port your phone number? Well, without getting too technical, the process is theoretically simple – your phone number gets removed from one phone company’s number inventory database and placed into the database of another phone company. But with Google Voice (and many other providers), this causes a big problem. Since Google Voice doesn’t actually own the phone number they don’t always get notified when you’ve moved your number away from them. This leads to your number possibly lying around in multiple databases. 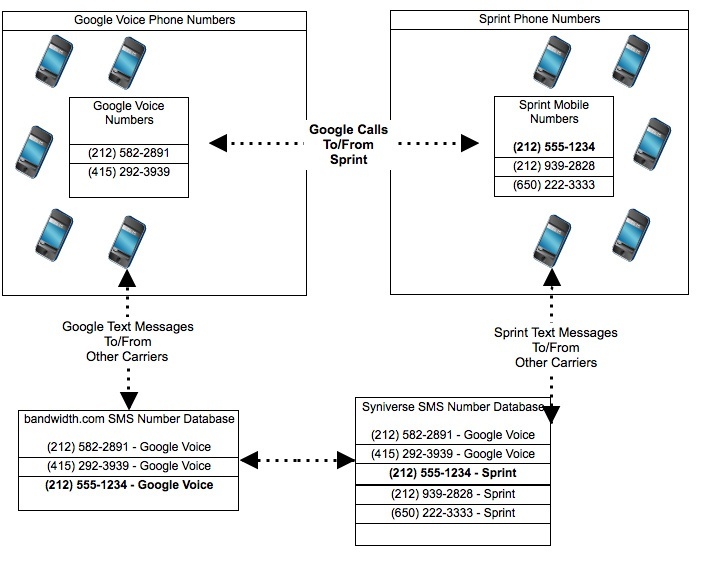 In this scenario, people who have phones on the Sprint network will be able to call you because they are calling Sprint to Sprint and the Sprint database is the first checkpoint. But Google Voice callers? They won’t be able to reach you because Google thinks they’re still the owner of that number. Even worse, those folks might get your old voicemail (still active on Google Voice), in which case they’ll think they are in fact reaching you, and you’re just ignoring their calls! Most people don’t know that SMS is actually a service that is often transmitted on a different network then voice calls. Interconnect companies, like Syniverse and TNSi keep databases of which phone companies own which phone numbers, strictly for the purpose of routing and optimizing text (SMS / MMS) message delivery. These databases are independent from the numbers that track your phone number for voice calls, adding another layer of complexity. It is this scenario that causes the most frustration – because phone calls between two people might be working just fine, but text messages do not. It seems random that this occurs, but it in fact is not. Let’s assume that porting (212) 555-1234 and your number properly got switched to Sprint’s database to make all voice calls work just fine. But check out the Syniverse database (which tracks which carrier owns a number for the purposes of text messaging) – it’s wrong! In the above picture, you can see that Syniverse incorrectly shows the (212) 555-1234 number is owned by Google Voice. The above scenario used to be fairly uncommon, but the problem has become even more severe as the number of layers between the databases has increased. Remember how earlier we mentioned that Google Voice doesn’t own their numbers, bandwidth.com does? Well guess what that means. You guessed it, another database! In the above scenario, bandwidth.com has the bad database entry. What does this mean? It’s likely that Sprint, Verizon and AT&T will be able to send text messages to the Sprint customer at (212) 555-1234, but Google Voice subscribers won’t be able to. To make matter worse, Google Voice subscribers will be able to call the Sprint number, but they won’t be able to text it. Frustrating and confusing! We think it’s time for some regulation here. Currently, there’s no reliable or formal process for asking a carrier to check their number database and make sure it’s correct. In addition, most customers are completely unaware of the issue at hand and blame the new carrier they’ve moved their number to for not working, when infact the problem is that the old carrier has not properly released the number! And of course, there’s no incentive for carriers to fix this. That said, if you’re willing to do the legwork you can usually call these carriers and explain the situation, if you know the right folks to contact. Google – You can post your complaint to their forums, which seem to be monitored by the Google Voice team. One such extremely long thread is here. These folks all ported away from Google and asked to get their numbers removed. For some, it worked. For others, not so much. Ask the porting department to file and escalate a ticket to have your number properly provisioned in their system and removed from any other systems. Sometimes they’ll help, sometimes they won’t, but it’s worth a try. Nothing you do on your phone will actually fix this, regardless of how many times you “reset” your phone. You usually need to have your issue escalated. Most companies have folks on the first-line support when you call who’ve never heard of Syniverse or TNSi and won’t know what you’re talking about. Make sure you get your ticket escalated - only the folks who do porting all day long have typically heard of this issue and know how to resolve it. If you ported a landline or VoIP number to/from Google Voice or to/from your cell phone carrier, you may also experience the problems above since some landline/VoIP carriers are now slowly enabling SMS on their phones also. You’ll want to call your old carrier to make sure they’ve properly removed your number. This problem is technically quite solvable. The first thing carriers could do is come up with better strategies and be more open about the ability to look up number ownership. Most customers would figure out quickly if the number ownership was incorrect. In addition, it should be possible to automatically spot-check number databases by comparing them with lookups on the SS7 (phone) network or via Syniverse and TNSi. One dirty little secret of these SMS networks (and why the problem is so prevalent) is that companies like Syniverse actually require you to upload a spreadsheet or CSV file of the phone numbers you own on a regular basis – a process that is horribly error prone as it’s often done by poorly written software or, worse, by humans. In addition, it’s probably time for some regulation here. Carriers have no incentive to take responsibility for ensuring number porting happens correctly on both SMS and Voice networks together, and have no proper escalation procedures. That said, most consumers remain unaware that you can always complain to your state’s Public Utilities Commission who has “back-door access” to management at nearly every phone company. Just google your state and “Public Utilities Commission Complaints” and you’ll find a webpage where you can submit a formal complaint about a phone company. This strategy is generally very effective as the phone companies can get in trouble or even fined if they get too many complaints or caught doing something they’re not allowed to. All in all, SMS, Voice and porting is all a huge cyclical mess. Try to avoid it if you can, or make sure you have someone experienced doing the ports who knows how to handle these scenarios if they occur.